The Heart of the South West LEP’s bid for a new enterprise zone has been approved by government as part of today’s Autumn Statement announcement. The multi-site enterprise zone is focused on two locations: Huntspill Energy Park near Bridgwater and the Exeter & East Devon Growth Point. These locations were chosen for their economic potential: a total of 177 hectares across five sites, with the potential to support 17,800 new high value jobs over the next 25 years and an additional £320m in GVA per annum to the UK economy by 2040. Enterprise zones enable the local area to retain a greater share of business rate income which would otherwise be returned to national government. They offer discounted rates to new businesses locating in the zones, simplified planning rules and other support, such as enhanced broadband provision. The bid was successful because of the clear alignment with the Heart of the South West LEP’s strategic economic plan, which identifies both Hinkley Point C in Somerset, and the growth potential of environment sciences in and around Exeter, as transformational economic opportunities. This builds on the success of the existing enterprise zone in Plymouth – which is focussed on marine industries – another of the Heart of the South West’s unique economic selling points. “We are delighted with today’s announcement of our successful bid. It demonstrates the government’s confidence in the HotSW area and its potential for transformational growth. 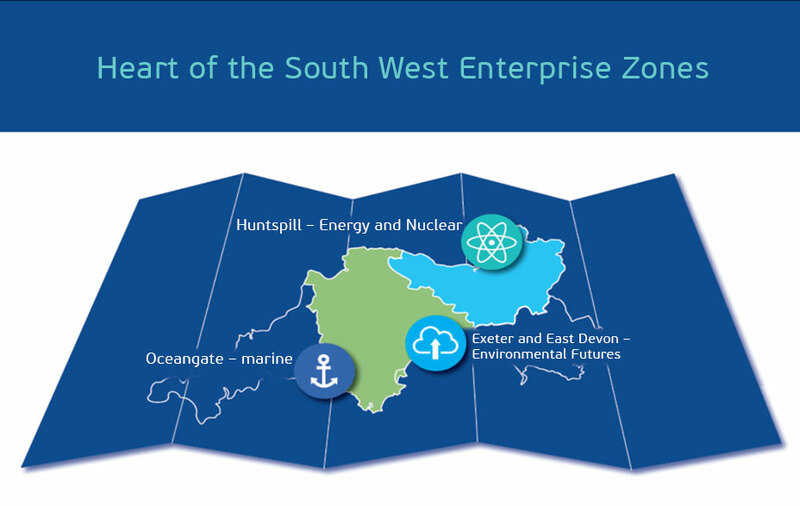 The new sites on our LEP-wide enterprise zone package build on the existing zone at Plymouth’s South Yard to offer economic opportunities for each of the key sectors in our strategic economic plan: Marine, Environmental Futures and New Nuclear. “We are delighted that our joint bid for enterprise zone status for Huntspill Energy Park at Puriton and its partner sites within East Devon has been successful. This new status will offer renewed opportunities to unlock employment and investment on the site, and in the surrounding area, as well as to enhance our ability to attract investment linked to Hinkley and beyond. Critically, it places BAE Systems site at Puriton within a small group of nationally important centres for growth spread across the country, recognising the effort being put in within the District and along the wider M5 corridor. We now look forward to working with Government on the detail of the bid in conjunction with our partners in Devon and the Local Enterprise Partnership. “We are over the moon to be awarded enterprise zone status as important recognition of East Devon’s strategy for growth with the potential to provide 10,000 jobs and 18,000 homes in East Devon alone. “We welcome the chance to work in partnership with Devon, Somerset and Sedgemoor Councils, to bring improved efficiency as the way forward for the future. The partnership will gain by sharing expertise and resources, and benefit from shared campaigns for inward investment and supply chain opportunities, as well as providing business support encouraging businesses to locate here. Earlier this year, the government encouraged LEPs propose new enterprise zones, and the successful ones were selected based on how LEPs demonstrated that EZ status will provide the catalyst for growth that these areas needed. HotSW LEP Board carried out a transparent process to seek expressions of interest from all local authorities, and the successful multi-site proposal was based on the government’s application criteria: strategic fit with the HotSW LEP’s economic plan; value for money – i.e. economic benefit and rate of return greater than the cost of the investment; and implementation – i.e. how will delivery be assured and local investment made to support the zone. Huntspill Energy Park is a 90 hectare site on a former munitions facility owned by BAE Systems. The Huntspill site is complementary to the government’s investment in Hinkley Point C; it supports the Hinkley supply chain and provides a platform for growth of a new nuclear cluster. EZ investment will help to secure growth in this sector and enable the construction of a new access road and remediation works. The East Devon EZ, across four sites totalling 87 hectares at Exeter Science Park; Skypark; Airport Business Park; and employment sites in Cranbrook, presents a good strategic fit to complement the government’s investment in the new MET Office supercomputer. The East Devon sites will be a platform for growth in the environment science and data analytics cluster, and the investment will secure growth and create new site infrastructure.